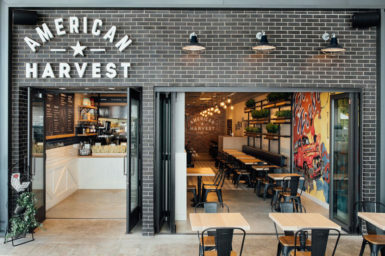 Designed by Celano Design, Inc., American Harvest is welcoming casual dining with a clean eating concept serving fresh and locally sourced meals to take with you or dine in. 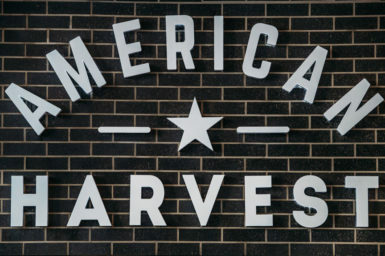 The new Brickell City Centre open air shopping center in Miami, FL will be home to American Harvest casual dining. 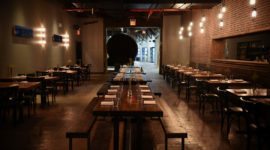 The location is approximately a 1,500 square foot space (900 sq. ft. FOH and 600 sq. ft. BOH). 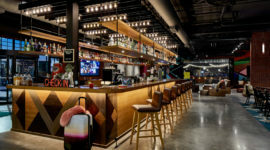 This concept includes an open kitchen with restaurant seating for approximately 50 people. 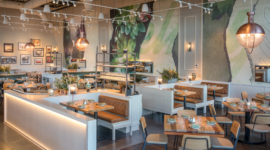 Once entering the space, the front counter is approachable with detailed millwork and the warmth of an oak countertop. 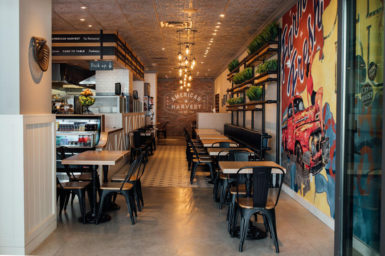 Textured glass with a chicken wire inlay diffuses the view to the kitchen, but still exudes the energy of the food preparation and subway tile gives the kitchen a backdrop with a pop of color. 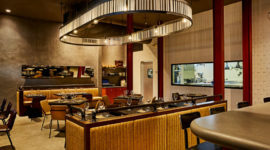 The furniture is simple and laid back with touches of artwork reminiscent of farm fresh quality.